If you have read any of my other reviews, you have learned that I am lazy. This is not an opinion, this is a highly cultivated thesis. Monday through Friday 9am -5pm, I spend my time troubleshooting phantom issues for idiot users who break good working equipment. The last thing I want to do when I come home is run cable to the new device i decided to stick in the nether regions of my house. This puts me in a horrible predicament, even greater than my desire to avoid cabling, is my disgust with lag and choppy media. TRENDnet has developed the answer. Please meet the TEW-691GR 450Mbps Wireless N router. 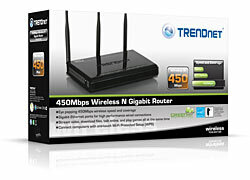 “TRENDnet’s 450Mbps Wireless N Gigabit Router, model TEW-691GR, redefines wireless router performance. This router’s raw horsepower seamlessly streams HD movies to your entertainment center, transfers content from countless users, and generates record wireless coverage. Gigabit Wide Area Network and Local Area Network ports transfer wired data fast. Embedded GREENnet technology reduces power consumption. In addition to being lazy I’m a skeptic, I’m not going to give this router the benefit of the doubt. All the speed in the world does you know good if you can’t use it. Join me as we take an in depth look to see if all this “raw power” has wheels.